Turn it off and back on again. You have undoubtedly heard these words of advice for fixing anything technological countless times. Sometimes it works, but what do you do when it is late, you have a project due and it does not? You pay a visit to the trusted Wreck Techs of course! 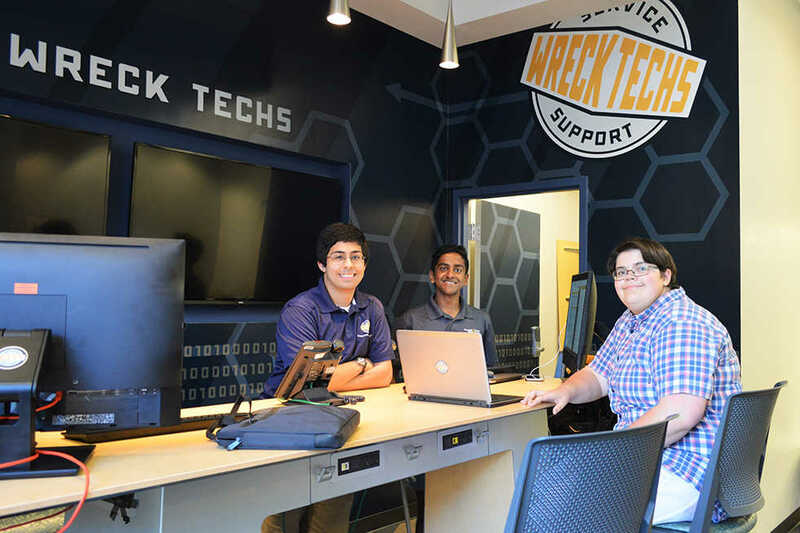 Located at the Curran Parking Deck and Britain Rec, Wreck Techs is Tech’s free technology help desk dedicated entirely to students. With hours that fit students’ schedules and knowledge about Institute specific issues and services, they are well-equipped to help you troubleshoot your issue. No issue is too small for Wreck Techs. Even trivial issues such as connecting a new device to the Wi-Fi or downloading MATLAB can have problems, and that is where Wreck Techs step in. “People often come here having issues with their laptops, or they need help installing software or opening a program. That’s where we can really help,” said Wreck Tech’s staff member, Nabil Esmail. Esmail, who has been with Wreck Techs for two years, sees Wreck Techs as being vital to keeping stress levels on campus, especially with regard to technology, low. “We try to push our team members to learn new skills in our free time so that we can always be improving,” explained Esmail. “We’re here to help students so we’re always working to be better and to help more people,” he continued. This motivation is reflected in the experiences of students who have gone to Wreck Techs in search of assistance. “I could not for the life of me get Microsoft Office to work on my new computer, so I went to the Wreck Techs. Sure enough they fixed it in a jif, and I was able to get to work,” said Jcak Fenton, second-year ME. It is of note, however, that Wreck Techs is not able to assist with hardware issues such as faulty screens or batteries. Rather, they specialize in software-related issues. “We’ve had people come to us after pouring water on their keyboard, either because they spilled it, [or] were trying to clean their keyboard. As much as it pains us, we just can’t help with that,” said Craig Raslawski, who has been a staff member with the Wreck Techs for four years. They can always, however, point you in the right direction for help. Their experience with a plethora of issues means that they know the people who can help in the event that they are not able to. “If you have any questions, whether you think we can help or not, come to us anyways. We’ll point you in the right direction. We are here for the students,” said Raslawski. Outside of troubleshooting, the Wreck Techs are responsible for many other aspects of your daily interaction with technology. Wreck Techs work behind the scenes to make sure that all of the printers in the residence halls are working, that you and your devices are able to connect to the Wi-Fi, and that moving in to your residence hall is seamless when it comes to technology. Just as issues with technology are greatly varied, so too are the ways in which Wreck Techs can help. They offer walk-in hours Sunday through Friday at both of their locations, one at the Curran Parking Deck, and one in Britain Rec. The Wreck Techs also offer email, phone and online live chat for those wishing to troubleshoot without going into the office. Lastly, they even offer in-room service in the event that it is required. “It was Sunday evening and I needed to submit a report, but my Wi-Fi wasn’t working. Thankfully Wreck Techs was open and able to help me connect. Their hours work really well with a student’s schedule,” said Kristen Goldie, third-year CS of the Wreck Techs’ varied means of support. So next time you are plagued with any kind of issues with technology, and turning your device off and then back on again just does not seem to be working, make sure to pay a visit to the Wreck Techs. They will surely do their best to make sure you are up, running and ready.